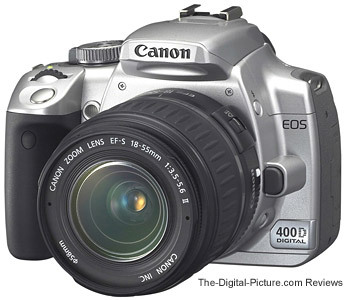 Note: The Canon EOS Rebel XTi / 400D has been replaced by the Canon EOS Rebel XSi / 450D. With each iteration of the Digital Rebel family, Canon raises the bar on image quality and camera features while lowering the introductory price. This iteration brings us the Canon EOS Rebel XTi / 400D, an entry level-priced DSLR with professional level image quality and capabilities. The EOS Digital Rebel XTi (USA), EOS Digital Kiss X (Japan) and EOS 400D (everywhere else) is easy enough for a beginner to use but powerful enough to get the job done for many professionals. In 18 months, Canon sold 1.2 million 350D/Rebel XT DSLRs. 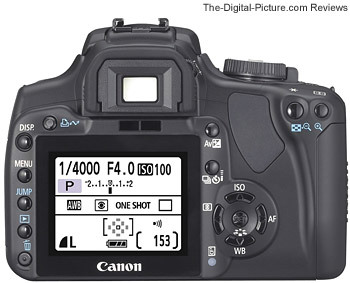 The 400D/XTi will take its place in the market. Note: Canon seldom discontinues updated DSLRs when new models come out. The old models are reduced in price for a period of time - and then become unavailable. 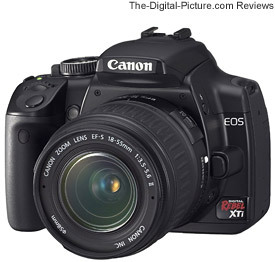 Leading the XTi's improvements list is the brand new Canon-designed 10.1 megapixel CMOS image sensor. Since this sensor retains the same format size (1.6x FOVCF), a more-dense pixel spacing is required. A denser sensor often results in lower image quality per pixel - and more noise. While the XTi does not deliver not the ultimate low light performance - its high ISO results are good. To accomplish this result, spacing between the on-chip microlenses is now approximately half that of its predecessor. A higher percentage of each pixel’s surface area is now sensitive to light. The output amplifiers have also been optimized. The second-generation, on-chip noise reduction circuit minimizes random noise and removes fixed-pattern noise. Canon digital SLRs have been renowned for their clean high ISO results. And, the new 400D is looking very good from this perspective. Remember, to properly compare ISO noise levels, the comparison exposures must be identical. The following images were shot in RAW format, output to 16-bit TIFF files, cropped & combined in Photoshop and saved as a very high quality JPEG image. The above link shows the same crop sizes (700x250 pixels) taken from nearly identically framed images. There is about a 1% difference in the actual framing of the sample shots due to what the respective LCD panels show during image review. The 400D/XTi LCD shows about 99% of the image, the 30D shows about 98%. None of these figures are enough to matter. This newly-designed sensor has another benefit - it shows less vignetting. Apparently the new microlenses with their tighter spacing are better-capturing angular light than the previous design. Use the mouseovers on the following links to see the difference. The dust shaker ... Sitting on top of the new sensor is another of the Canon EOS Rebel XTi / 400D's major improvements - a self-cleaning, sensor-sealing low-pass filter. Canon has attached an ultrasonic vibrating unit directly to the low-pass filter - negating the need for additional potentially-image-degrading glass in the optical path. Shaken-off dust adheres to a dust-holding material surrounding the low-pass filter - preventing it from getting back on the sensor. I wonder - does this material ever fill up? An indicator appears on the LCD while this cleaning is taking place and a faint noise can be heard. The 400D/XTi user has full control over the timing of the sensor cleaning with the default being very logical - at startup and at shutdown. As all of Canon's Digital SLRs are designed to be shooting-priority (if you press the shutter button, the camera immediately readies itself to take a picture), the sensor cleaning can be interrupted at any time to catch a shot. The frequent cleaning prevents some dust from becoming sticky - which requires a manual cleaning procedure. I currently get more email regarding sensor cleaning than any other specific question. If this works as advertised, the self-cleaning sensor feature is going to be greatly appreciated by everyone. I say "If" because I will need a longer period of time to draw my own conclusions - I am not anxious enough to evaluate this feature to purposefully let dust into my camera. Ironically, my 400D/Rebel XTi came with the dirtiest-from-the-factory sensor I have seen yet. And no, the self-cleaning sensor didn't make a difference. After using the XTi for a reasonable period of time, I will say I have noticeably less dust on my sensor but the system is not perfect. The XTi implements a secondary dust-fighting feature that Canon refers to as "Dust Delete Data Detection". DDDD uses an OOF (out of focus), narrow aperture photo of white paper (or anything similar) to determine where unshakeable dust remains. It then maps the dust out of the resulting images. This is certainly not as elegant of a solution as the self-cleaning sensor, but it is available. Of course, the good old fashion manual methods of sensor cleaning can still be implemented to remove this stubborn dust. Yet another major change (improvement) in the XTi revolves around the new, larger, brighter, 2.5" LCD display. The new LCD is 40% brighter than Canon's prior 2.5" LCD displays featured in the 1D II N, 5D and 30D and features a wide 160° viewing angle. The LCD is definitely nice, but at the highest brightness settings (brightness level is set using a menu option), gamma is increased enough to make exposure hard to determine. Use the histogram for this purpose. If you look at the back of the Canon EOS 350D/Rebel XT and visualize the 1.8" LCD being replaced by a 2.5" LCD without changing the body size, you quickly see a problem. There is no room. To resolve this issue, Canon removed the monochrome LCD panel and moved its functionality to the main color LCD. Current settings are now displayed in a black-on-white format on the 2.5" LCD. The XTi takes advantage of the additional available LCD real estate by displaying more information than the XT's mono LCD displayed. It didn't take me long to get used to the new display - and I like it better than the 350D/Rebel XT's small mono LCD. To prevent the white info display from being a distraction to picture taking (it is just below eye level), an infrared proximity detector (seen just above LCD in photo above) turns off the LCD when the photographer looks through the viewfinder. The LCD can be manually turned off as well. With this display off, the only way to tell that the XTi is powered on is to look at the power switch - or the new green power-on indicator LED located right beside it. The new power-on LED has proven unnecessary to me - the white display works much better. I suppose it might be helpful to those that keep the display turned off. An RGB histogram is a very useful new LCD-related feature - now you can watch all channels individually for blown highlights or blocked shadows. The XTi has inherited the 30D's high-precision 9-point autofocus unit. A sophisticated dual-precision/cross-type sensor in the center AF position is supported when f/2.8 or wider lenses are used. Focusing performance under low light has been improved by 1 stop (EV -0.5). My experienced focus hit rate has been very good with this lens - including the results from sports action at several soccer matches. The AF improvements are very welcomed. The viewfinder remains essentially the same as the 350D/XT - adequate. Large compared to point & shoot models, somewhat smaller than the 30D and much smaller than the full frame Canon EOS 5D and the Canon EOS-1DsII. New in-viewfinder indicators coming from the EOS 30D are an FE lock indicator and white balance adjustment (+/-). The following table illustrates sensor and viewfinder differences across the recent Canon Digital SLR models. Little change has been made in the size/weight of the 400D/Rebel XTi over the 350D/Rebel XT. The table below compares the size and weight of some current-at-this-time Canon DSLRs. Gone is the fingernail scratch-collecting 350D/Rebel XT coarse exterior finish. It has been replaced with a nicer smooth finish. A new "rubber slip guard" for the thumb and an improved grip shape in the back have been incorporated. The grip is also thicker - by a tiny 1 mm. The 400D/Rebel XTi body changes over the 350D/Rebel XT are nice but minor in my opinion. The grip continues to be small for my medium adult male hands. The upside is that the entire camera is small - it is easy to take everywhere. Adding the Canon BG-E3 Battery Grip provides a nicer normal grip - and a very nice portrait grip. The grip also allows a second NB-2LH Li-ion battery to be used. Battery life is rated at approximately 500 shots (73°F/23°C, flash off). My first battery lasted in the 600-700 frame range with some burst shooting and no flash use. These batteries are very small - it is easy to take several with you for those long shoots. The battery power remaining indicator now has 4 levels, rather than 3. The XTi continues to use cross-keys for changing settings and navigating menus. However, the buttons now have a nicer (in my opinion) smooth, non-rubber finish. And, the set button is no longer required to be pressed after making setting changes. This is a more intuitive design in my opinion. Additional changes ... Picture Style settings are now available. Folder management with manual folder creation is now a feature as is up to 9,999 images per folder. Four Custom Functions were added or changed: SET button functions (Picture Style, Quality, Flash exposure compensation adjustment, Flash exp comp, AF frame selection), Long exposure noise reduction (Off/Auto/On), Magnified view (Image playback only/Image review and playback) and LCD display when power ON (Display/Retain power OFF status). Auto image rotation with three options (not recorded, record don't rotate, record and rotate) is now provided. Print / share / direct print features have been improved. Depth-of-field preview is enabled in the Creative Zone modes. Of course, one of my favorite improvements is the XTi's $100 lower introductory list price. The image quality coming out of the Canon EOS Rebel XTi / 400D is excellent - We expect nothing less from Canon and they have delivered. 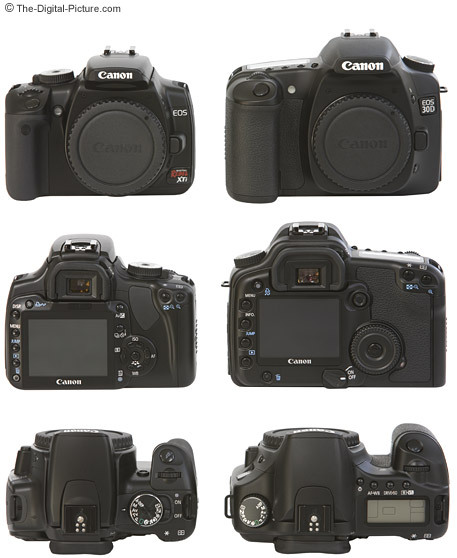 Image quality is, however, different from Canon's other recent DSLRs. Since a change such as this takes time to get used to (post processing-wise), I will continue to evaluate my results. But, what I am seeing is a new tone curve. Reds, yellows, and oranges seem to be slightly darker while blues seem slightly lighter. The tone curve seems to push shadows darker - but the detail remains. In addition, the 400D/XTi meters 1/3 stop darker than the 30D. Maybe Canon got tired of looking at our blown highlights. The list of features and specifications for this camera is very long - I refer you to Canon's white paper (highly recommended - linked in the other information section below) for this information. In this white paper, Canon gives the reasons why they chose to omit image stabilization from their camera body. Basically, the reasons are, because they can build more effective image stabilizers in the lens (tuned for the focal length range) and because a stabilized sensor does not yield a stabilized viewfinder. Canon continues to include their Digital Photo Pro software in the box. Other third party software may arguably provide better features, but I continue to use DPP because I like Canon's conversion image quality the best. 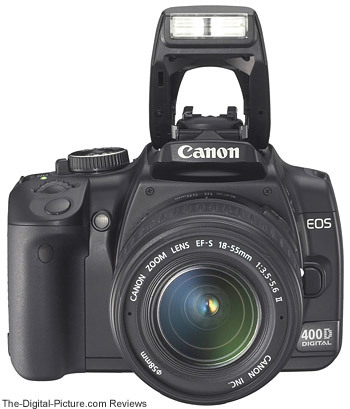 Many people considering the purchase of a Canon EOS Rebel XTi / 400D will also look at the Canon EOS 30D. While many of the previously discussed XTi improvements are not found in the 30D body, the 30D has many advantages of its own. Obviously the 30D is larger (on the right in the comparison images above), but along with the larger size comes what most people will find to be a more comfortable grip - it is larger and rubberized. Also somewhat larger is the 30D's viewfinder which has a .9x magnification compared to the Rebel XTi's .8x viewfinder. The 30D's shutter lag is much shorter at 65ms vs. the XTi's 100ms (same as XT) lag. This is noticeable when a shot must be taken at a precise time - think sports. I find that capturing the precise sports moment is easier with the 30D than with the 400D/Rebel XTi. And I need to learn to release the XTi's shutter button earlier to prevent an extra frame when shooting in burst mode. The 30D's 5 fps frame rate with shorter mirror blackout is also a sports shooting advantage over the XTi's 3 fps rate. The 30D is louder. The 30D has a more-rugged magnesium alloy build - and feels more solid. 30D has 1/3 stop ISO setting increments and has ISO 3200. 30D has Kelvin white balance. The 30D has a pentaprism viewfinder while the XTi utilizes a pentamirror. The 30D sports a thumb wheel and joystick while the XTi uses cross key buttons. The 30D's shutter life rating is significantly higher than the XTi's which is "the same as in the Digital Rebel XT" (Canon's XTi White Paper). [Note: I am getting some email regarding an apparent conflict in the XTi's rated shutter life. My understanding is that the XT & XTi's shutter life is around 50,000 actuations - a very high number. Apparently a 100,000 figure (same as the 30D) is also floating around. I welcome correction if I am wrong.] The 30D has an LCD panel on top. 30D has spot metering, a PC Synch port, a heavier-duty neck strap (with red edges). Thus, the decision is not an easy one. And sorry, I can't answer it without knowing your specific situation. If you want a big step up in capabilities from a prosumer point & shoot camera, the 400D/Rebel XTi will be an excellent choice. This may be the right time for original Canon 300D Digital Rebel users to make a jump as well - The XTi's features and image quality improvements are definitely significant enough to justify this upgrade. For 350D/Rebel XT owners, well, if you want the latest and greatest - and the cool factor - go for it. The improvements will be nice - but a new lens might make a bigger difference in your results. I suggest EOS 30D owners wait for the next 30D upgrade to be released unless they see a must-have feature in the 400D/XTi - or better yet, go for a Canon EOS 5D (the price has come down). Email me if you need other upgrade recommendations - be sure to tell me what you use the camera for. For an entry-level-priced Digital SLR, the Canon EOS Rebel XTi / 400D has more features than most entry-level-priced Digital SLR buyers will ever use - and has performance and image quality to satisfy many professional needs. Overall, I'm pleased with this DSLR. After determining that a 400D/Rebel XTi is going to live at your house/business, you need to decide which lens(es) you are going to use with it. 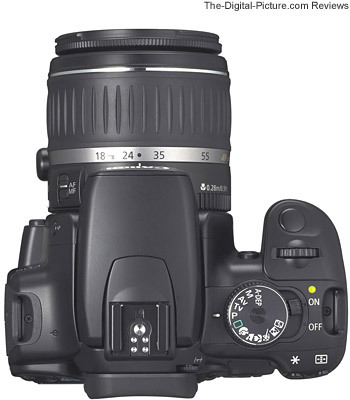 The EF-S 18-55mm lens is available in one variation of the XTi kit. When purchased with the kit, this lens is a reasonable value. For those wanting to get the most from their DSLR, I suggest one of the other separately available lenses. Start your lens search on the Canon Lens Recommendations page.